No film has been covered as in depth on this blog site as the original Steven Spielberg classic. If you go back a year to the 40th anniversary, you will see that I saw the movie on the big screen four times in 10 days and did a different post on each one of those visits. 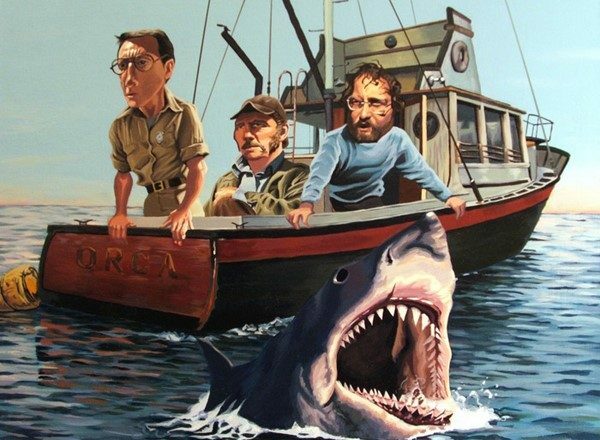 You will also be able to find an extensive collection of posts at the following: Jaws Week. It is late however, and I have some obligations in the next few hours so I will keep this years comments short. First, I think this may be the first time I saw the movie at the Egyptian Theater, a spot that has become my go to cinema for classic films, including several events each year at the TCM Classic Movie Film Festival. The popcorn is good, the butter flavor rich and they have Coke Zero. Oh yeah, they also have the coolest old school design on the Boulevard. In introducing the program and telling everyone the rules of conduct, our host tonight asked how many people were seeing the movie for the first time. I was flabbergasted to see nearly a third of the packed house raise their hands. While it surprised this veteran of at least a hundred trips to Amity over the years, it also created a great expectation on my part. I had to ask myself if the film would still work on a fresh audience that is jaded by the speed and CGI of today’s films. I can safely report that when Ben Gardner makes his final appearance in the movie, the screams were loud and people again levitated out of their seats. When the shark first shows up in profile, there is another jump, and everyone still nervously laughs at Roy Scheider’s ad-libbed classic line. There are two more great scares, a dozen moments of levity that all break the tension in glorious ways and you can tell they were all working tonight. Finally, there was a loud outburst of cheers and applause when the hero solves the problem of the shark in a most satisfying conclusion. As always, I picked up a couple more tidbits of information during the screening. In the hundred times I’ve seen the movie, this was the first time I noticed the timeline continuity error in the police report for Chrissy’s death and the date of the attack on Alex Kitner. Why I had not worried about it before is beyond me, but I think I’d go crazy if I worried about all those kinds of things. A movie is made up of a million moving parts and sometimes the cog in one section is out of synch with the gears in another section. Something that bothers me a little more because it seems like it should be obvious. At dinner, when Quint is telling the story of the Indianapolis, I suddenly realize that he and Hooper have finished their meals and that Brody hasn’t even touched his food. It may be the framing on the big screen that makes this more noticeable, or maybe because Shaw is so compelling when he does the monologue, you don’t really take tour eyes off him much. So the Chief has a queasy stomach on the ocean with the more experienced sailors. That’s one more small detail that is so brilliant in making these characters real and representative of their types in the story. I also think that different prints or sound systems may emphasize some parts of the music or the dialogue a bit more from one screening location to another. After forty years, it’s great to say the movie still succeeds and there are still small moments to discover.